Wild animals are bred for the trophy hunting tourism but cubs and young animals are also used to generate income. When cubs are removed from their mothers soon after they are born the lionesses can mate quicker again. Breeding farms welcome volunteers to take care of cute cubs by telling them they do conservation or run a sanctuary for orphaned cubs. Petting trips are also offered to families as an educational part of their holiday. While parents are hunting the children can pet and spend time with cubs or take them for a walk. For animals all this is of course very stressful and unnatural. A bit older lions bite and scratch in a manner which is not pleasant. 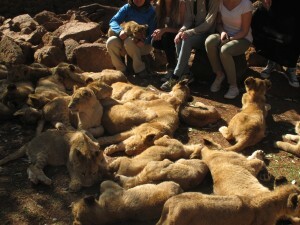 They are taken to Walk with Lions safaris. Lions are conditioned to follow the tourists with walking sticks so that visitors can take selfies among so called free lions. When lions grow too dangerous for tourists they are sold to hunting farms. Volunteering is more and more popular especially among young adults as a form of travelling. Of all the volunteers in South Africa 95 % are foreigners. 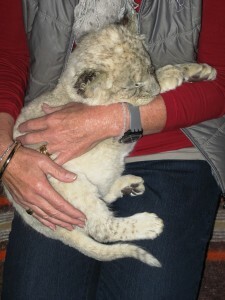 They are told that the breeding programme is a form of conservation and in due time cubs are released in the wild. Volunteers think their work contributes to the wildlife conservation but captive bred, hand-reared predators can never be released in the wild. Genuine sanctuaries do not let visitors touch their rescued animals, they do not have breeding programmes and they don’t trade animals. There are a few rules of thumb which help to choose a volunteering programme in wildlife conservation. First, if you have to pay more than your cost of living is, it is not volunteering. Second, if any part of volunteering work is done in interaction with animals or in their shelters, the facility is not a sanctuary and has nothing to do with conservation. Third rule is that there are no privately run farms at this moment that are involved in lion conservation. And finally, captive bred animals cannot be released in the wild because they are accustomed to people and they are genetically contaminated. – Join or support the Trophy Free EU Group. – discuss about the issue with decision makers of your country and in European Union or other global unions and coalitions close to you. – Be open and state your stance regarding trophy hunting openly. – Talk about canned hunting to people and tell them why we need to ban the import of hunting trophies. – Inform those planning to volunteer about petting tourism and tell them how it is possible to make sure not to support this cruel business. – Discuss with hunters. Canned hunting is against acknowledged hunting ethics. – Discuss the topic openly when dealing with travel agencies. Be specific and do not accept the answer if you are told they have someone local to check the project or service. – If you know any organization or travel agency arranging trophy hunting or providing opportunities for petting and lion walking, share your information with us!